Delta 4 Launches - Solar System Planets And Moons Section. Delta 4 Heavy Launches, But Falls Short. 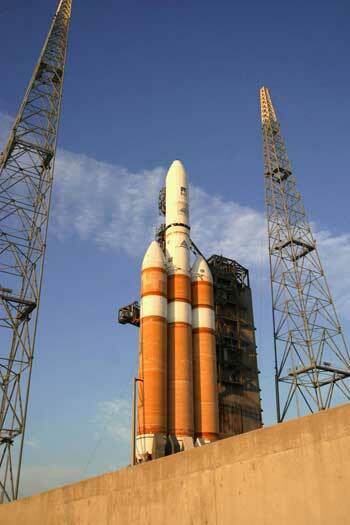 Delta 4 Heavy rocket Cape Canaveral. The first Delta 4 Heavy rocket lifted off from Cape Canaveral Tuesday evening, but it appears there was a glitch that put the rocket's satellite payload into an incorrect orbit. The rocket's first stage shut down 8 seconds earlier than expected, so the upper stage was fired longer than originally planned to compensate. Flight controllers still haven't made an official announcement about the demonstration payload it was carrying, but two additional nanosatellites haven't made contact yet. NASA is considering this vehicle as a potential replacement for some of the space shuttle's cargo carrying duties, so the launch was being watched carefully. The Delta IV Heavy lifted off from Space Launch Complex 37B, Cape Canaveral Air Force Station, Fla., at 4:50 p.m. EST, on a demonstration launch for the Air Force's Evolved Expendable Launch Vehicle (EELV) program. The demonstration satellite was deployed following a 5-hour and 50-minute flight. "The EELV program and Boeing invested in today's demonstration launch to ensure that the Delta IV Heavy, the only EELV Heavy variant available, is ready to launch our nation's most important national security payloads into space," said Dan Collins, vice president of Boeing Expendable Launch Systems. "While the demonstration satellite did not reach its intended orbit, we now have enough information and confidence in the Delta IV Heavy to move forward with preparations for the upcoming Defense Support Program launch in 2005." A preliminary review of the data indicates that a shorter than expected first-stage burn led to the low orbit. However, according to the Air Force EELV program office, the primary flight objectives were accomplished in today's all-up test of the new launch vehicle. The heavy boost phase, the new five-meter upper stage and five-meter payload fairing, extended coast, upper stage third burn and payload separation, and activation and usage of Space Launch Complex 37B for a Heavy launch were all successfully demonstrated. "I want to thank our entire Delta team, including our government and industry partners," Collins said. "Their efforts, hard work and focus have once again moved our industry forward. We have a very happy and confident customer, thanks to all the hard work put in by this team."